Top Down Is Dead. Lead From the Middle! 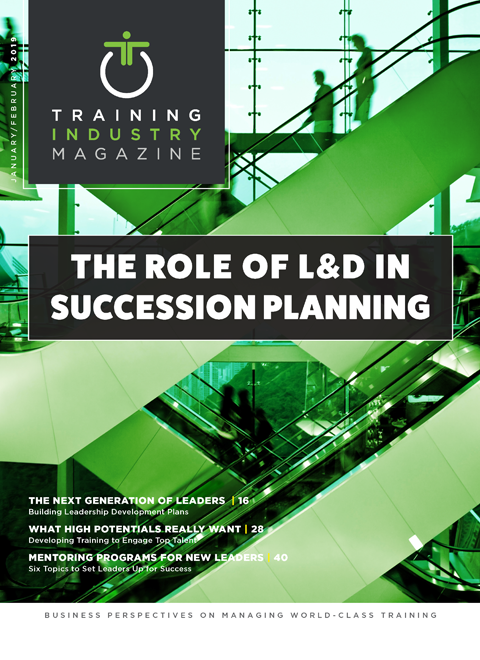 Traditional succession planning in many organizations is a separate function from training and development. Succession planning, by definition, focuses on the select few, while training and development is viewed more as a value add for all to move a company forward. Both are usually housed within the HR department, but often only overlap when high potentials’ areas of growth are identified and referred on to the learning function for mastery. This traditional approach poses an increasing area of risk for organizations. In today’s climate of heightened talent shortages and a migratory workforce with multiple options, people simply aren’t waiting around for someone to notice their talents. Organizations are also now being forced to focus on keeping and developing the staff they have, rather than relying on an influx of new workers that aren’t coming, and that includes filling their managerial and leadership pipelines from within. What if we turned the succession planning paradigm around and offered the training and development function as the “scout” function of your succession planning efforts? Who better to see potential leaders at all levels of the organization than those interacting with them and assessing them routinely while developing them? This approach is a win-win for both groups, with an added benefit for the workplace at large. Training and development can better identify high-potential leaders at all points in their development and refer them into the succession planning function when the time is right. Succession planners will have an ally that can help them keep the planning pipeline full. Lastly, your workforce will benefit from a robust talent model that provides opportunity for advancement and career pathing easily, even for those who aren’t included in traditional succession planning efforts. Leadership development should be a pillar of your succession planning strategy. Historically, C-level executives were considered the keepers of strategy and vision, and line-level managers, much like their line staff direct reports, were viewed as easily replaceable and were not included in the hierarchy, or budget, targeting abundant leadership development. Fast forward a decade or so, and my, how times have changed! According to industry research, today’s work environments cite the “attraction and retention of valued employees as one of the most critical issues faced.” Companies are realizing turnover doesn’t just deprive your business of a single worker to be replaced, it also deprives you of the social capital that a departing worker takes with them – those relationships with your customers and employees that make your business a success. However, half of the organizations in a recent research study said their existing leaders are not skilled to effectively lead their organizations today, and a startling 71 percent said their leaders are not ready to lead their organizations into the future. Only 25 percent of organizations said they had a ready and willing successor identified for one out of 10 critical leader positions. And into the future, 84 percent of organizations anticipate a shortfall of leaders in the next five years. Eighty-three percent of organizations say it is important to develop leaders at all levels, yet only 5 percent have done so. Not surprisingly, 58 percent of organizations’ top priority is closing leadership skill gaps. So, if developing leaders already in seat has become a priority, how do we go about that? One area we are lax in is the assessment of incoming mangers to our organizations, especially if they have been managers for a previous employer. How many of us actually vet managerial competencies? Usually these positions are “filling a need” emergently, and we fill slots, rather than spending the extra time to find the best fit, making a critical assumption that if you were a manager previously, you must have skills. Sorry, but in a nutshell, that’s tantamount to letting someone you don’t even know make decisions for your business. Organizations could do a better job of assessing skills prior to hire when selecting line-level managers. Whether that means a more comprehensive interview and reference protocol, the incorporation of solid assessment tools, or observation and testing in their probationary window or some combination of all, we need to do a better job of determining where these managers fall on a spectrum and develop plans to get them to proficiency. Once you have gaps identified, you can then begin the design process as to how you want to help these leaders achieve competency. It can be a variety of assets and people that get you the desired result. One area that seems to be disassociated with leadership development is the question of teaching and exhibiting our own organizations’ cultural expectations. In the past, we have taught culture separately – usually as mission, vision and values, and it is all of that. But oftentimes, organizations still struggle with identifying and embedding culture largely because we don’t teach finite ways to model this behavior for others within our leadership curricula. Lee and Holtom’s work on job embeddedness can be instrumental in how to teach and strengthen culture in our organizations that goes above and beyond the usual practice of mission, vision and values. And it has the added bonus of providing a framework new hires need to successfully adopt your culture and stay. Job embeddedness outlines the various “fits” that new hires are seeking in their first few months with a new organization. They also want to know that their organization’s “espoused values” are actually “values in practice,” and they will be hyperaware of a mismatch in this regard. They are trying to validate that they have made the right decision to come on board. Our existing employees and managers need to understand how pivotal they can be in providing feedback and encouragement to those who are just coming into our organizations. It doesn’t take much time and you already have those people at your disposal, so why not teach them their role in helping with others’ engagement? Think about a time you stayed at a job just for the people. We all have at least one of those stories. This is job embeddedness at work. This is culture at work. We are missing the mark by not tying our culture efforts into our retention efforts and leveraging job embeddedness helps us do both. When this is done well, your succession planning pipeline is bolstered. Our leadership curricula need to include teaching them how to interact with their direct reports, ensuring practice to mastery for these “human interaction” skills, and the inclusion of evaluation metrics for the business to include markers for performance. The Center for Creative Leadership reminds us that there are so many ways to get more out of leadership development. Protect against overload. Build in the expectation that time is needed to reflect, practice, fail (yes, fail! ), plan, and implement change during the development process. Use coaching. One-on-one or group coaching can provide high-touch support, create continuity and provide perspective. Offer reinforcements. People may want to reinforce a key lesson, dig deeper into a challenge, or share ideas with co-workers. Offer related or targeted courses, webinars, lunch-and-learns, tools, books, or online learning. Build a community of practice or social networks. Some organizations build networks where “graduates” of specific leadership development programs can maintain connections, share tips and experiences, and discuss challenges. remind employees that development is important to the organization. Succession Planning and T&D – A Match Made in Heaven! Line leaders may not set strategy directly, but they will be the driving force in how your strategy flows down to line staff and is acted upon. Much of the innovation in organizations is bubbled up through line leaders. They are also the lynchpin in change management efforts, helping staff see what change affects them directly and react successfully to change. By combining the power of succession planning with strong leadership development via your training and development (T&D) experts, your organization will be well positioned to react swiftly to changing business needs, including adequate pipeline for your succession planning efforts. Not only will they be your leaders of tomorrow, but your retention efforts also depend on qualified, human-focused leaders. Leadership development should be a pillar of your succession planning strategy – not only to keep managers, but honestly, to keep everyone else! Jan Wilson, M.Ed., SHRM-SCP, SPHR, is an organizational development and learning consultant. Her area of specialty is turnover and retention and leadership development in the health care space.